Some of you have been asking for an update on Younger Daughter. 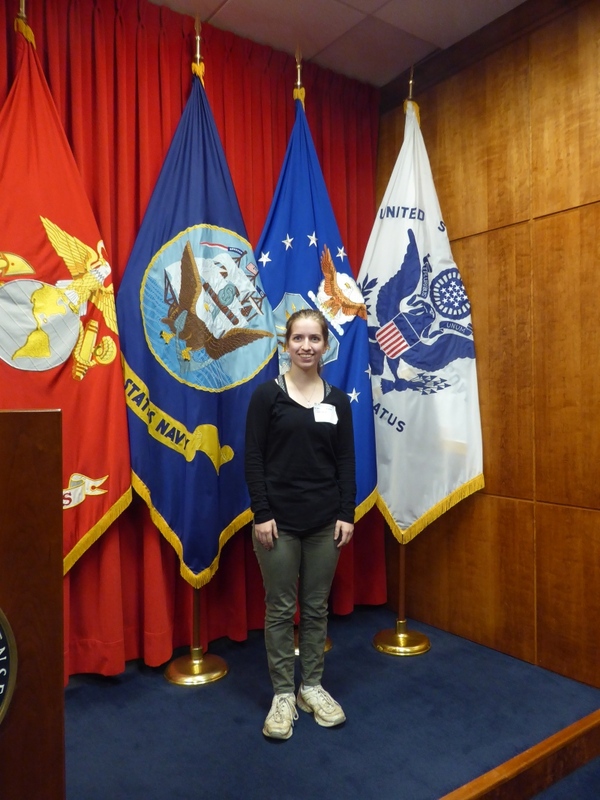 Our dear daughter, if you remember, is now in Navy boot camp in Great Lakes, Illinois. She was able to make her one phone call upon arrival to let us know she'd arrived safely and to let us know she would be shipping her personal effects home. She would also be permitted a phone call in a couple of weeks. After a bit we got her mailing address, and we all (meaning, friends and relatives) have been blitzing her with mail, to her great delight. And on her first written exam, she scored 90 percent. Then out of the blue last week, she called. Yes, called -- when such a call was NOT expected. "Hi Mom," she said. "Long story short, I'm in the hospital with double-pneumonia." Turns out conditions in boot camp are rather dirty, despite the general tidiness. Plus, of course, she's "racking" with 90 other women from all over the country. Early one morning on her fourth night of "mid watch" (midnight to 4 a.m. watch duty), an RDC looked at her sharply -- she was swaying -- and asked if she was okay. She snapped to attention and replied she was fine. Once I got over the shock of her being in the hospital, it turns out she was actually feeling pretty well, considering an IV was pumping antibiotics into her and she had to stop to cough and gasp every so often. But she felt like she was in a luxurious resort: her own bathroom and shower, room service, and visits from the RDCs with smiles rather than the obligatory yelling. And she was able to call people! In fact, I think she spent four days solid on the phone. She called us twice a day, she called her grandparents, she called friends. It was hilarious. She expected to return to her division on Saturday (that was Oct. 28), and from the abrupt phone silence we expect that's exactly what happened. She felt confident she would be able to keep up with her Division despite the time in bed, rather than getting set back and having to complete boot camp with another division (she expressed great fondness for her group). So that's the scoop so far on Younger Daughter. She's a trooper, I tell ya. Takes me back to Lackland Air Force base summer of 1967. Not the hospital part but the basic training part. Although it seems endless I assure her it will be over one day. Thank you for the update. Sorry that she had the sickness but glad that she impressed the DI. Hang in there mom she will do well! LOL - I guess there are moments in life when even BAD news is good news. I’ve been wondering about YD as well but felt I shouldn’t ask. I’m really pleased to hear that YD is doing well! My spouse is fond of their Sailor boot camp days; lots of laughs of the antics and comedy of errors - now. Glad to hear YD recovered nicely too. Fourth watch in a row??? I'll BET the RTCs were being nice. Someone messed up. She really IS a trooper! Glad she's doing well and is on the mend. that not all of the younger generation is selfish and narcissistic. As an Army veteran I salute the daughter and her parents both. You are the mother of one of America's finest. Thank her for her service for me. Thank Goodness! This is WONDERFUL NEWS! Navy mom here. Our son enlisted weeks before 911 happened and all communication cut off for a week. Then when he was out on his ship and the Tsunami hit Indonesia we heard nothing for a couple weeks. He's out now and lives close but still, every time a hear his voice now I treasure it. Please thank your daughter from me, for her service. Wow. Talk about heart-in-throat moments. So what you're saying is I can expect a new crop of gray hair? I expect a big cause of the pneumonia is the change in humidity. Idaho runs an average air humidity below 20% (sometimes well below) and Illinois runs an average of 80%. I got pneumonia twice in the first year after moving from dry Colorado to Illinois. Interesting thought! I went the opposite direction (Ohio to Idaho) this summer and continually noticed I felt like a dried out sponge. Spent lots of time sucking down water and slathering lotion on face and hands. There’s definitely a major moisture difference!!! as a navy veteran (wave) I was taken back to my boot camp days in '71....what an adventure it was back then for me and I know your youngest is having the adventure of her lifetime right now. Good for her! Glad she is doing better. Seems like her parents (ahem...) had a lot to do with her fine character. I hope YD is doing better. Thank her for her service, and thank you for yours, in raising a fine young woman! I drove past a Navy recruiting station yesterday and thought about younger daughter. Isn't it funny how close you feel about people you've only known through blogs? We live up the road a bit from Great Lakes (an hour or so, on the other side of the cheddar curtain). We hope she is doing better! Army Dad here. Oldest is in Army Basic Combat training in the Carolinas. Got our phone call. He says it's easy but . . . people get sick and they get tired and entropy happens. Wishing the best for your daughter. FB.